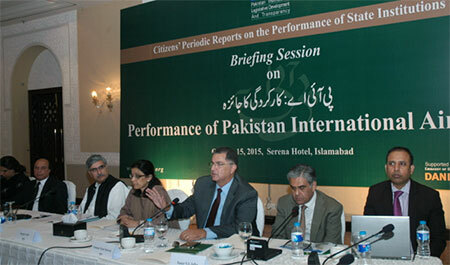 On October 15, 2015 PILDAT hosted a briefing session on the Citizens’ Periodic Report on Performance of Pakistan International Airlines (PIA) in Islamabad. Ms. Nargis Sethi, Former Secretary Defence and Cabinet Secretary authored the report. Key findings of the report were shared with the participants followed by perspective of political parties presented by Sardar Muhammad Latif Khan Khosa, Secretary General Pakistan Peoples Party (PPP) and Senator Nauman Wazir Khattak, Pakistan Tehreek-i-Insaf (PTI). Mr. Nasser N. S. Jaffer, Chairman PIA, also briefed the guests on constraints to PIA’s revival. During the session Ms. Nargis Sethi shared her research findings and highlighted how PIA is vulnerable to failure at the hands of incompetent human resource and political interference. Contrary to the Government’s vision of privatisation of PIA by March 2016, Ms. Sethi suggested minimum political interference in the operations of the airlines. She stressed on how qualified and independent Board of Directors (BoD) should be appointed to deal with the decisions of PIA. She also recommended that worker unions should not blackmail management and work in the interest of the employees and the company. Lastly, she proposed formation of an autonomous and independent regulatory authority that can solely focus on regulating PIA as a profitable entity. Sardar Muhammad Latif Khan Khosa expressed Pakistan Peoples Parties (PPP) disagreement with PML(N) on privatisation of PIA. He argued that PIA is a national flag carrier and it is imperative that the government and PIA management is held accountable for bringing the airline to this vulnerable stage. He also expressed his discomfort over the high employee to aircraft ration and suggested that an immediate action be taken to revamp the human resource outlook of the corporation. Finally, he stressed upon the role of parliamentarians in voicing this issue and proposing the needful to revamp PIA. On behalf of Pakistan Tehreek-i-Insaf, Senator Nauman Wazir Khattak presented certain recommendations to revive PIA without privatising it. He reaffirmed that human resource is one of the major issues faced by PIA. Merit-based recruitment and relevant work experience should be mandatory for senior management hiring. The role of the Ministry should only be restricted to appointment of capable Board of Directors and allow them to run PIA under the ideology of good governance as a corporate entity. Chairman PIA, Mr. Nasser N. S. Jaffer, confessed the internal issues of PIA are much grieve than highlighted during the session. He identified incompetent human resource as a reason for decline of the airlines. However, financial restructuring is underway to revive PIA. He also stressed that the Honourable Prime Minister and Advisor to PM on Aviation have mandated the Chairman to revive PIA and not to privatise it. He clarified that all major decisions are being taken through the BoD. Mr. Ahmed Bilal Mehboob, President PILDAT, and Ms. Aasiya Riaz, Joint Director, PILDAT deliberated the briefing session. They encouraged the guests to engage in the discussion session. Various participants raised questions and proposed recommendations. The participants included parliamentarians, media representatives and members of civil society and academia for the discussion on the way forward for PIA. Parliamentarians present for the discussion session included Ms. Asyia Naz Tanoli, MNA (NA-282, Women Punjab- X, PML-N), Ms. Nafeesa Inayatullah Khan Khattak, MNA (NA-322, Women Khyber Pakhtunkhwa, PTI), Ms. Aisha, MNA (NA-329 District Swat,Women KPK, Jamat-e-Islami), Senator Ms. Khalida Mohsin Qureshi (PPPP, Punjab), Mr. Sajid Nawaz, MNA (NA-3, Peshawar III, KP, PTI), Senator Farhatullah Babar (PPPP, KP), Mr. Bismillah Khan, MNA (NA-43, Tribal Area-VIII, FATA, IND), Mr. Siraj Muhammad Khan, MNA (NA-6, Nowshera-II, KP, PTI). On this occasion, representatives from the Pakistan International Airlines included Mr. Nayyar Hayat, Chief Financial Officer, PIA and Mr. Daniyal Gillani, General Manager, Public Affairs, PIA. Members from the aviation division included Mr. Ahmed Latif, Senior Joint Secretary (Aviation) and Mr. Farooq Hassan, Deputy Secretary (Flying). Other eminent personalities part of the discussion included Mr. Talat Masood, Defence Analyst, Mr. Ayaz Wazir, Former Ambassador, Mr. Wazir Jogezai, Former Deputy Speaker of Pakistan, Mr. Asif Ezidi, Former Ambassador, Mr. Iftikhar Ullah Baber, Former Secretary Senate were also present for discussion.